Portable chargers are a great way to keep your phone or other electronic devices charged up throughout a tournament day. Throw it in your bag and keep your phone charged, even if you’re playing music or keeping stats. 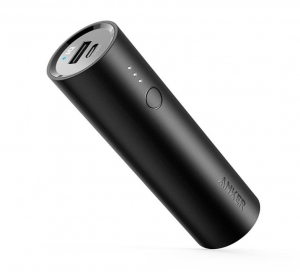 Today, Amazon has the Anker PowerCore 5000 Portable Charger on sale for its lowest-ever price: just $14.39. With 5000 mAh of battery life, it will fully charge your iPhone 6s twice or Galaxy S7 more than once on a single charge. At just over four inches long and just over an inch wide, it fits easily alongside a phone in a pocket or any bag. Anker is a high quality charger brand; we use some of their bigger chargers here at Ultiworld! The charger has 4.7 out of 5 stars from over 450 reviewers on Amazon. For more great deals, check out our Deals page and follow us on Twitter at @UltiworldDeals. Comments on "Deal Of The Day: Ultra-Portable Charger"